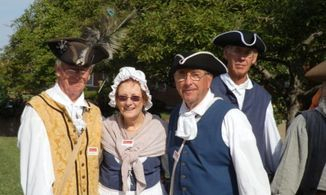 The Annapolis Convention took place from September 11-14, 1786 at Mann's Tavern, which used to sit on what is now a fences parking lot behind Chick & Ruth's Delly. Tasked with assessing the Articles of Confederation in order to figure out how to enable it to allow Congress to raise the necessary funds to pay foreign creditors left over from the Revolutionary War and domestic creditors that included unpaid veterans from that war, the members of the Annapolis Convention decided instead to call for a new convention the following year in Philadelphia, a meeting that ultimately produced the Constitution. The dialogue below has been created from the convention's known itinerary and their final report, written by Alexander Hamilton. Dialogue that is bolded (Acts II and III) comes from actual quotes by those men, gathered from published materials and referencing words spoken before, during or after the 1786 Annapolis Convention, including Hamilton's report and The Federalist Papers. 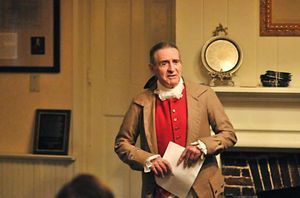 This play was first performed at the 2013 National Continental Congress Festival, Sept. 11-14 at the Annapolis Masonic Lodge no. 89 by Hall of Presidents personnel and several colonial actors from Watermark. James Madison: Hello, everyone. I am James Madison of Virginia. I serve in the Virginia state legislature, a position I have held since 1784. I want to welcome all of you to Mann’s Tavern here in Annapolis. I am joined in the Virginia delegation by Edmund Randolph and Saint George Tucker. Edmund Randolph: Greetings. I am Edmund Randolph of Virginia. My uncle was Peyton Randolph, the first President of the First Continental Congress. Uncle Peyton died before independence was declared, but I can assure you, he supported our cause. Saint George Tucker: Good afternoon. I am Saint George Tucker of Virginia. I am a lawyer from Chesterfield County. Last year I wrote a paper advocating a common American commercial policy, which caught the attention of Governor Patrick Henry, so here I am. Alexander Hamilton: Gentlemen, I am Alexander Hamilton of New York. I was General Washington’s Chief of Staff and I recently founded the Bank of New York. I am joined in the New York delegation by Egbert Benson. Egbert Benson: Hello. I am Egbert Benson of New York. I am the state’s Attorney General. Abraham Clark: Greetings. I am Abraham Clark of New Jersey. I represent Essex County in the New Jersey legislature. I am joined in the New Jersey delegation by William Houston and James Schureman. William Houston: Gentlemen, I am William Houston, a lawyer from Somerset County, New Jersey. James Schureman: And I am James Schureman, former New Brunswick representative to the New Jersey state legislature. Tenche Cox: Hello, everyone. I am Tenche Cox, a merchant from Philadelphia representing Pennsylvania. George Read: Good afternoon. I am George Read, a Court of Appeals judge from New Castle County, Delaware. I am joined in the Delaware delegation by Richard Bassett and John Dickinson. Richard Bassett: Greetings. I am Richard Bassett and I serve Kent County in the Delaware state legislature. John Dickinson: And I am John Dickinson, representing Delaware at this convention. I served under Edmund’s uncle, President Peyton Randolph, at the first Continental Congress in 1774 and the second in 1775. I represented Pennsylvania from 1774-76, during which I wrote the Articles of Confederation, but before the Declaration of Independence was ratified, I left Congress and joined the Pennsylvania militia, where I earned the rank of Brigadier General. I did not vote on the Declaration; I had abstained, but although I fought against the British after it was signed, my home in Philadelphia was confiscated while I was away and turned into a hospital. I resigned from the Army, went to Delaware and became a successful farmer. I freed my slaves in 1777. From then until this meeting, I remain the only Continental Congress delegate to free his slaves. In 1779, I went back to the Continental Congress, this time representing Delaware, and in 1781, I became President of Delaware. In 1782, I became President of Pennsylvania, briefly serving in both capacities simultaneously. I served as President of Pennsylvania until this past October. Madison: Impressive credentials, John. No one understands the Articles of Confederation better than you do, since you wrote them. Whether they can be amended in order to solve the complex issues that have arisen since the war remains to be seen, but I’m sure I speak for everyone when I say that you should serve as this convention’s chair, since we are here to discuss, and, if we can, solve these problems, and thus we will need to draw on your experience and insight into this document. Dickinson: I would be honored, James. I am at your service to address these problems in the most efficient manner possible. Madison: Gentlemen, this is the ideal place to begin this process. George Mann bought this property in 1783 from the Commissioners of Confiscated Property, who had seized it after Loyalist Lloyd Dulany fled Annapolis at the outbreak of the war. Hamilton: How ironic, then, that the city Lloyd Dulany left would rise to such prominence after the war that drove him from his home! Madison: That is true, Alexander. This city saw the first attempts to transition from the war to governing. After the Treaty of Paris was signed in September of 1783, General Washington retired from the military here, and the Continental Army was disbanded. The Treaty was then ratified by Congress not far from this building, at the Maryland State House. Before the Congress left Annapolis in 1784, it appointed one of its delegates, my friend Thomas Jefferson, as minister to France after he authored a Land Ordinance that turned the territories between the Appalachian Mountains and Mississippi River into new states, which put us on the border of the French territory of Louisiana. Dickinson: This expansion has not been without violence, James, which I do not believe is the proper method to address geographical boundaries or solve political disputes. Madison: John, Washington was concerned about that as well, so at his urging, to protect those states and other frontier forts, Congress, under President Thomas Mifflin here in Annapolis, temporarily authorized a small Regular Army. Dickinson: Yes, they were the first national troops not to serve under Washington. Madison. Correct. Thus, here in Annapolis, the nation began to blaze a new trail. But the going was very rough. The various states had competing land claims and could not agree on sovereignty of the waterways between them. In Virginia, Washington strongly recommended to me that the Potomac River, on which sits his home, be used as a trade route to connect the states and western territories, so although Congress had reconvened in Trenton, New Jersey in November of 1784, I called a meeting in Annapolis that December between Virginia and Maryland to create a corporation, the Potomac Company, to develop the river and settle the disputes over its ownership. Randolph: Yes, and Washington represented the Virginia delegation that reached this agreement and became the corporation’s first president, right here in Annapolis. Madison: Edmund is right. After the successful creation of the Potomac Corporation, I called for a second meeting between Maryland and Virginia the following March, in 1785, which ultimately met at Washington’s home, Mount Vernon. Washington did not lead the Virginia delegation this time, but his advice and reasoning as host were invaluable toward crafting a Compact that provided for navigational rights on the Potomac and Pocomoke Rivers and the Chesapeake Bay covering tidewater navigation and extending to such issues as toll duties, commerce regulations, fishing rights, and debt collection. Edmund Randolph and I were appointed to be Virginia delegates to this meeting, but Governor Patrick Henry failed to inform us of this appointment, isn’t that right, Edmund? Randolph: I’ll say! Give him liberty or give him death? How about giving him retirement! The man is 50 years old. I hope he doesn’t intend to continue as governor past this year at such an elderly age. I have a good mind to succeed him when I get back! A disgrace, it was. Gov. Henry didn’t inform any of the Virginia delegates about their appointments. That’s why no one was there to meet the Maryland delegates in Alexandria, which resulted in a relocation to Mount Vernon. Madison: I agree, Edmund. The meeting in Virginia was a most disorganized affair until it was moved to Mount Vernon. After the Compact was reached, the two states agreed to a third meeting, but the Maryland delegates, led by Samuel Chase, were adamant that further negotiations should take place back in Annapolis. When I heard of this, I expressed agreement, since the first meeting there had gone so well. At this third meeting, Virginia and Maryland were supposed to return to Annapolis accompanied by all of the other states. And this time, Mr. Randolph and I were informed of our appointments. Randolph: (chuckling) For a change. Madison: And that is how we got here, gentlemen, as delegates and as a nation. We have been tasked with fixing the great problems facing our nation since the end of the war. Hamilton: But only five states are present. James, where are the other eight delegations? Madison: Alexander, I am told that New Hampshire, Rhode Island and Massachusetts appointed delegates, but they haven’t arrived yet. Now that Shay’s Rebellion has started in Massachusetts, perhaps their delegates were called back. Hamilton: What about North Carolina? Madison: They, too appointed delegates, but none of them are here. Hamilton: And Connecticut, South Carolina and Georgia? Madison: They decided against sending delegates. Madison: Several of the southern states, and even some of the states that sent delegates, are concerned about an expansion of national power at their expense. Hamilton: What about Maryland? I thought it was their idea to meet here? Madison: That was when it was supposed to be a third meeting with Virginia, Alexander, before it turned into a national convention. Maryland didn’t appoint anyone to meet with us, but like Washington did at Mount Vernon last year, they agreed to be the host with no formal role. Hamilton: James, if the New Hampshire, Massachusetts, Rhode Island, and North Carolina delegates arrive, that represents three-fourths of the states, which is what we need to amend the Articles of Confederation. Dickinson: We are not here to legislate, Alexander. We have not been given that power from our respective states. The best that we can do is to either promote new laws that the states must pass collectively, policies that Congress must endorse, or else recommend that an entirely new constitution be written. Hamilton: But how can we reach an agreement on how to do that if the other states are not here to hold such a discussion? Madison: By holding it without them and then informing them, and Congress, of our findings. The problems we face are not new; they have been building up for some time now. Dickinson: I agree, James. The other states are well aware of what the nation faces. We will adjourn here after writing a report and sending it to Congress and to the other states regarding the next steps to be taken in order to successfully address the pressing issues before us. There are many great challenges we must overcome, many responsibilities our governments must shoulder. Indeed, the very fate of the United States is in our hands. Madison: We must also understand that it is quite possible the Articles of Confederation cannot be saved. They may be inadequate to effectively govern now that the war is over. Dickinson: James, this is precisely what we are all here to discuss. I want everyone here to make a list of all of the problems your states have encountered in regard to property, individual rights, trade, commerce, regulations and defects in the overall federal system. I want all of you to work very hard tomorrow detailing all of the associated issues regarding these problems, as well as any others you can think of. We won’t meet tomorrow, so that you can take the day to work on these problems and what you feel must be done about them. We will reconvene on Thursday the 13th at 9’oclock sharp. We are hereby adjourned. Dickinson: Good morning, everyone. I, John Dickinson of Delaware, hereby call this meeting to order. Have you all brought the lists I asked you to create? All (showing their lists): Here! Here! Dickinson: Good. Who wants to start? Madison (standing): I will, Mr. Chairman. Complaints are everywhere heard from our most considerate and virtuous citizens, equally the friends of public and private faith, and of public and personal liberty, that our governments are too unstable, that the public good is disregarded in the conflicts of rival parties, and that measures are too often decided, not according to the rules of justice and the rights of the minor party, but by the superior force of an interested and overbearing majority. However anxiously we may wish that these complaints had no foundation, the evidence, of known facts will not permit us to deny that they are in some degree true. It will be found, indeed, on a candid review of our situation, that some of the distresses under which we labor have been erroneously charged on the operation of our governments; but it will be found, at the same time, that other causes will not alone account for many of our heaviest misfortunes; and, particularly, for that prevailing and increasing distrust of public engagements, and alarm for private rights, which are echoed from one end of the continent to the other. We need only to analyze Shays’ Rebellion in Massachusetts in order to understand this. Shays and his bunch have taken over the county courts in Northampton and Worcester and refused to disburse. Neighboring states had to call up their militias after Massachusetts took no military action; instead, the state supreme judicial court decided to issue eleven indictments of sedition, but rumors abound that Shays will take over that court as well. To me, the issue is whether it would conduce more to the interest of the people of America that they should, to all general purposes, be one nation, under one federal government, or that they should divide themselves into separate confederacies, and give to the head of each the same kind of powers which they are advised to place in one national government. Dickinson: Shays and his men are defending their property, James. We cannot be happy, without being free; we cannot be free, without being secure in our property, and we cannot be secure in our property, if without our consent, others may, as by right, take it away. Hamilton (standing): Mr. Chairman, the subject speaks its own importance; comprehending in its consequences nothing less than the existence of the Union, the safety and welfare of the parts of which it is composed, the fate of an empire in many respects the most interesting in the world. Madison: Mr. Chairman, Alexander is correct; the United States has a chance to demonstrate to the world that among the numerous advantages promised by a well constructed Union, none deserves to be more accurately developed than its tendency to break and control the violence of faction. The friend of popular governments never finds himself so much alarmed for their character and fate, as when he contemplates their propensity to this dangerous vice. Dickinson: That remains to be seen, James. Shays believes that he and his followers have property rights that take precedence over the government’s ability to take that property away, even if debts are owed. If my property cannot be secure; if others over whom I have no kind of influence, may take it from me by taxes, under pretence of the public good, then how am I secure from the enforcement of their demands? By being subject to arbitrary, expensive, and remote jurisdictions? I know how Shays feels; my own home was confiscated, not because of debts owed or even for being a Loyalist; indeed, I had already joined the Army to fight the Revolution! My supposed “crime” was, I didn’t vote for Independence! Do we want a government that can make the decision to seize private property? Property is absolutely necessary for prosperity, for individuals and for the nation. Let us take care of our rights and we therein take care of our prosperity. Randolph: Yes, let us discuss our rights. To assess the current system, we ought to inquire, first, into the properties which such a government ought to possess; secondly, the defects of the Articles of Confederation; thirdly, the danger of our situation; and, fourthly, the remedy. The properties of government best suited to protect our rights depend on what kind of rights we are seeking to ensure. Madison: I can speak to that, Edmund. Bills of attainder, ex post facto laws, and laws impairing the obligation of contracts, are contrary to the first principles of the social compact, and to every principle of sound legislation. The two former are expressly prohibited by the declarations prefixed to some of the State constitutions, and all of them are prohibited by the spirit and scope of these fundamental charters. Our own experience has taught us, nevertheless, that additional fences against these dangers ought not to be omitted. This convention must add a constitutional bulwark in favor of personal security and private rights; and I am much deceived if you all have not, previously, consulted the genuine sentiments of your constituents on these matters. The sober people of America are weary of the fluctuating policy which has until now directed the public councils. They have seen with regret and indignation that sudden changes and legislative interferences, in cases affecting personal rights, become jobs in the hands of enterprising and influential speculators, and snares to the more-industrious and less informed part of the community. They have seen, too, that one legislative interference is but the first link of a long chain of repetitions, every subsequent interference being naturally produced by the effects of the preceding. They very rightly infer, therefore, that some thorough reform is wanting, which will banish speculations on public measures, inspire a general prudence and industry, and give a regular course to the business of society. Randolph: I agree, James. The business of society is paramount. But the current economic crisis has been very difficult to overcome. I believe that it is an utter necessity that we prevent the fulfillment of the prophecies of the American downfall. Hamilton: You are correct, Edmund. The ideas of men who speculate upon the dismemberment of the empire seem generally turned toward one confederacy becoming three: the first consisting of the four Northern states, the second of the four Middle states, and the third of the five Southern States. According to this distribution, each new confederacy would comprise an extent of territory larger than that of the kingdom of Great Britain. Nothing can be more evident than that the thirteen States will be able to support a national government better than one half, or one third, or any number less than the whole. If, in addition to the consideration of a plurality of civil lists, we take into view the number of persons who must necessarily be employed to guard the inland communication between the different confederacies against illicit trade, and who in time will infallibly spring up out of the necessities of revenue; and if we also take into view the military establishments which it has been shown would unavoidably result from the jealousies and conflicts of the several nations into which the States would be divided, we shall clearly discover that a separation would be not less injurious to the economy, than to the tranquility, commerce, revenue, and liberty of every part. Randolph: It simply cannot be allowed to happen, Alexander. The economic crisis must be overcome before our nation falls apart in the manner which you describe. Hamilton: It already happening, Edmund. We have reached almost the last stage of national humiliation. There is scarcely anything that can wound the pride or degrade the character of an independent nation which we do not experience. Are there engagements to the performance of which we are held by every tie respectable among men? These are the subjects of constant and unblushing violation. Do we owe debts to foreigners and to our own citizens contracted in a time of imminent peril for the preservation of our political existence? These remain without any proper or satisfactory provision for their discharge. Have we valuable territories and important posts in the possession of a foreign power which, by express stipulations, ought long since to have been surrendered? These are still retained, to the prejudice of our interests, not less than of our rights. Are we in a condition to resent or to repel the aggression? We have neither troops, nor treasury, nor government. Are we entitled by nature and compact to a free participation in the navigation of the Mississippi? Spain excludes us from it. Is public credit an indispensable resource in time of public danger? We seem to have abandoned its cause as desperate and irretrievable. Is commerce of importance to national wealth? Ours is at the lowest point of declension. Madison: With the worst to come, I fear. Alexander is merely providing an update of the current situation. If the Articles of Confederation were simply capable of reversing this declension, then we should urge the states to amend them accordingly, but we are well past that point now, as Alexander has admirably enunciated. We have been empowered by our respective states to seek a remedy for the dire circumstances the nation is in. The remedy for this inconveniency is to divide the legislature into different branches; and to render them, by different modes of election and different principles of action, as little connected with each other as the nature of their common functions and their common dependence on the society will admit. Dickinson: James, the all wise Creator of man impressed certain laws on human nature. A desire of happiness, and of society, are two of those laws. They were not intended to destroy, but to support each other. Man has therefore a right to promote the best union of both, in order to enjoy both in the highest degree. Thus, while this right is properly exercised, desires, that seem selfish, by a happy combination, produce the welfare of others. I designed the Articles of Confederation to prevent a new tyranny, in order to safeguard individual rights. How does dividing Congress into more powerful branches accomplish this? Madison: Mr. Chairman, it may be necessary to guard against dangerous encroachments by still further precautions. As the weight of the legislative authority requires that it should be thus divided, the weakness of the executive may require, on the other hand, that it should be fortified. It is of great importance not only to guard the society against the oppression of its rulers, but to guard one part of the society against the injustice of the other part. Different interests necessarily exist in different classes of citizens. If a majority be united by a common interest, the rights of the minority will be insecure. There are but two methods of providing against this evil: the one by creating a will in the community independent of the majority; that is, of the society itself; the other, by comprehending in the society so many separate descriptions of citizens as will render an unjust combination of a majority of the whole very improbable, if not impracticable. Dickinson: Very improbable is not impossible, James. The experience of all states mournfully demonstrates to us that when arbitrary power has been established over them, even the wisest and bravest nations that ever flourished have, in a few years, degenerated into abject and wretched vassals. Is there no way to simply correct the deficiencies in the Articles of Confederation rather than strengthen central power? Randolph: Mr. Chairman, in speaking of the defects of the Articles of Confederation, I want to make clear that you have my highest respect as its author. You did all that a Patriot could do, in the infancy of the science of constitutions and confederacies, when the inefficiency of requisitions was unknown: no commercial discord had arisen among any states; no rebellion had appeared, as in Massachusetts; foreign debts had not become urgent; the havoc of paper money had not been foreseen; treaties had not been violated; and perhaps nothing better than the Articles could be obtained, from the jealousy of the states with regard to their sovereignty. But this is not 1777; it is 1786. The Articles of Confederation produced no security against foreign invasion, Congress not being permitted to prevent a war, nor to support it by their own authority. There are many examples of this, most of which tend to show that the Articles cannot cause infractions or treaties, or the law of nations, to be punished; that particular states are not restrained from, by their conduct, provoking war without control; and that, neither militia nor drafts being fit for defense on such occasions, only enlistments can be successful, but these cannot be executed without money. Congress cannot currently check quarrels between states, nor a rebellion in any, not having constitutional power, nor the means, to interpose accordingly. Counteraction of commercial regulations of other nations is not attainable under the Articles of Confederation. Congress can neither defend itself against encroachments from the states nor become paramount to the state constitutions, ratified as it was in many of the states. Mr. Chairman, this nation is in grave danger of disintegrating into anarchy. Again, it is now 1786. I appeal to your sense of what is best for the United States. The remedy must be the republican principle. Madison: I agree, Edmund. In the republican principle, whilst all authority in it will be derived from and dependent on the society, the society itself will be broken into so many parts, interests, and classes of citizens, that the rights of individuals, or of the minority, will be in little danger from interested combinations of the majority. We must recommend a proper federal system. Justice is the objective of government. It is the objective of civil society. It ever has been and ever will be pursued until it be obtained, or until liberty be lost in the pursuit. In a society under the forms of which the stronger faction can readily unite and oppress the weaker, anarchy may as truly be said to reign as in a state of nature, where the weaker individual is not secured against the violence of the stronger. Hamilton: Allow me, James. The additional securities to republican government, to liberty and to property, consist chiefly in the restraints which the preservation of the Union will impose on local factions and insurrections, and on the ambition of powerful individuals in single States, who may acquire credit and influence enough, from leaders and favorites, to become the despots of the people; in the diminution of the opportunities to foreign intrigue, which the dissolution of the Confederacy would invite and facilitate. Mr. Chairman, I say this with all the sincerity and respect for your accomplishments that I can muster: I should esteem it the extreme of imprudence to prolong the precarious state of our national affairs, and to expose the Union to the jeopardy of successive experiments, in the chimerical pursuit of a perfect plan. Dickinson: (pause) The ayes have it, then. Alexander, will you draft for all of us a report to Congress and the other states that we will take up first thing tomorrow, Friday the 14th, at 9’oclock sharp? Hamilton: It would be an honor, Mr. Chairman, but I ask that Mr. Madison and Mr. Randolph assist me with this report. Dickinson: Very well. But remember, we have been tasked with suggesting improvements to the current system, not necessarily replacing it, although that may be the only way to improve it. Nevertheless, while I want the report to enunciate all of the major points and arguments that have been so compellingly put forth here in Annapolis, I also want the report to clearly recommend another meeting explicitly empowered to frame measures to strengthen the Articles of Confederation. Give Congress and the states that choice. We are hereby adjourned until tomorrow morning. Dickinson: Good morning. I, John Dickinson of Delaware, hereby call this last meeting of the 1786 Annapolis National Convention to order. Mr. Hamilton, have you brought a draft of the report I asked you to write? Dickinson: Would you kindly provide us with an overview? Hamilton: Certainly. I begin with a summary of the powers each state had given their delegation to this convention. New York, Pennsylvania and Virginia each empowered their representatives to focus on trade and commerce and return with a constitutional proposal that, if passed, would remedy the current inefficiencies of the current system by amending the Articles of Confederation in such as way as to enable Congress to act decisively. Delaware gave similar powers to their representatives with the added stipulation that any such legislative proposal first be submitted to, and passed by, Congress, and then the states would ratify the change. I also noted how New Jersey’s representatives were empowered to move beyond trade and commerce and take into consideration all of the deficiencies of the current system and what would be added to address them as a whole. As we have previously noted, the states of New Hampshire, Massachusetts, Rhode Island and North Carolina appointed delegates but none of them arrived while we were in session, while the states of Connecticut, Maryland, South Carolina and Georgia did not appoint delegates at all. The report recognizes, however, the role that Maryland and the city of Annapolis played as the host of this convention. Dickinson: What about the next meeting? Hamilton: I go right into that, Mr. Chairman. The report calls for speedy measures to be taken, to effect a general meeting, of the States, in a future Convention, for the same, and such other purposes, as the situation of public affairs, may be found to require. I also add that such a meeting should not be restricted to the issues of trade and commerce, and I note that our convention in Annapolis went well beyond those topics and into equally urgent matters such as property rights, individual rights, national security and an assessment of the strengths and weaknesses of the Articles of Confederation as a whole, and that the report we have submitted will reflect those discussions. Madison: Mr. Chairman, I added to Alexander’s statement that those discussions were an improvement on the original plan to discuss only trade and commerce, and thus deserve to be incorporated into a future Convention, and that if they, as we were, are naturally led to this conclusion, in the course of their reflections on the subject, they should consider that the power of regulating trade is of such comprehensive extent, and will enter so far into the general System of the federal government, that to give it efficacy, and to obviate questions and doubts concerning its precise nature and limits, may require a correspondent adjustment of other parts of the current Federal System. Dickinson: The states sent their representatives here to focus on trade and commerce, so if we are going to add these other topics for discussion, which would seem to exceed the strict bounds of their appointments, I think we should also add that we did so dictated by an anxiety for the welfare of the United States. Randolph: Mr. Chairman, I took great pains to state very clearly that the fact that there are important defects in the current system of the Federal Government is acknowledged by the Acts of all those States to empower delegations to the present Meeting to begin with; that the defects, upon a closer examination, may be found greater and more numerous, than even our report implies. Further, it is at least, so far, probable, from the embarrassments which characterize the present State of our national affairs, foreign and domestic, as may reasonably be supposed, that these defects merit a deliberate and candid discussion, in some mode, which will unite the Sentiments and Councils of all the States. As far as the choice of which mode it should be, I stated that we are of the opinion that a Convention of Deputies from the different States, for the special and sole purpose of entering into this investigation, and digesting a plan for supplying such defects as may be discovered to exist, will be entitled to a preference from considerations, which will occur, without being particularized. Madison: Mr. Chairman, we also specifically emphasized that we declined an enumeration of those national circumstances on which their opinion respecting the propriety of a future Convention, with more enlarged powers, is founded; as it would be a useless intrusion of facts and observations, most of which have been frequently the subject of public discussion, and none of which can have escaped the penetration of those to whom they would in this instance be addressed. They are, however. of a nature so serious,as, in the view of the delegates to the Annapolis Convention, to render the situation of the United States delicate and critical, calling for an exertion of the united virtue and wisdom of all the states under the Articles of Confederation. Dickinson: Good. That will get their attention. Did you recommend a time and place? Hamilton: Yes, Mr. Chairman. With the most respectful deference, we begged their unanimous conviction that it would greatly advance the interests of the Union if the States that sent delegations to Annapolis would procure the concurrence of the other States in the appointment of new delegations to meet at Philadelphia on the second Monday in May next, to take into consideration the situation of the United States and to devise such further provisions as shall appear to them necessary to render the constitution of the Federal Government adequate to remedy the inefficiencies of the current system. Dickinson: Add that our quite urgent recommendation that all states send delegations to meet next May in Philadelphia will also be sent to the Congress and that we expect the Congress to take up the matter immediately. Dickinson: Have you else anything to add, James? Madison: Just some advice about this next meeting in Philadelphia. Whatever is decided, be it a revised Articles of Confederation or a new Constitution, it will be of little avail to the people that the laws are made by men of their own choice if the laws be so voluminous that they cannot be read, or so incoherent that they cannot be understood. What is proposed must be clear, effectual and long-standing. After all, what is government itself but the greatest of all reflections on human nature? John Dickinson: Aye! The 1786 Annapolis Convention is hereby adjourned until the next meeting, with all of the states, in Philadelphia! Sounds of gaveling. Lights go out.